Enjoy your holidays in Greece! 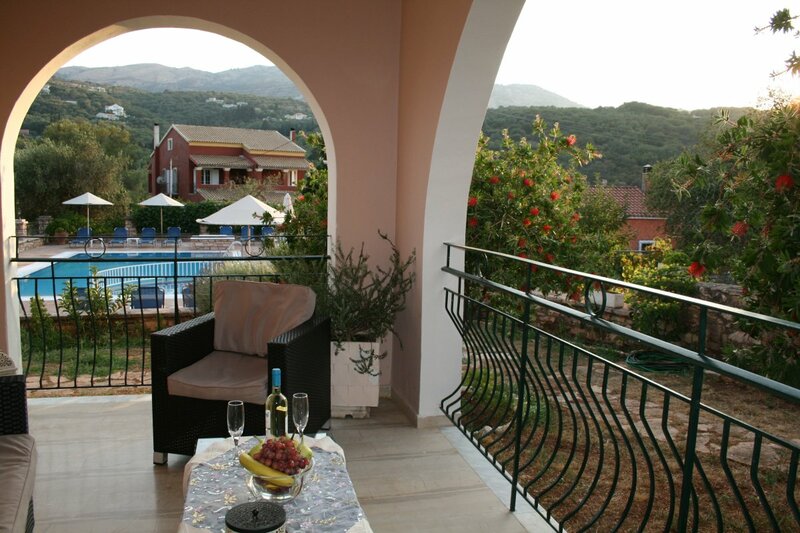 Being surrounded by the olive trees, the appartments can guarantee calmness and relaxation during your holidays in Hellas. You can relax on the balcony and admire the marvelous countryside as the deep silver-green veil made up by the olive leaves dives into the Ionian Sea; you can enjoy yourself by the swimming pool using the available free sunbeds and umbrellas and, as for the children, a smaller one is offered to play in ; you can have a walk in kasiopi village and enjoy the greek atmosphere, as the distance from the centre ofthe villageis about 400 meters; you can also walk and go swimming to the nearest beach (about 400 meters to the beach Kalamionas and Votana and about 1 km to Avlaki beach). Access to the main road that connects Korfu Town (Kerkyra or Kerkira)to Kasiopi is also very easy. Each of our 2bedroom self-catering apartments that you can rent, can hos tfour persons andconsists of a kitchen, a bathroom, two bedrooms and a veranda. Their decor is simple and classic, with warm greekcolours. Functionality and privacy have become ourspecial facility. Each apartment offers all the necessary equipment to satisfy the daily needs of a family on holidays in Greece, such as oven, fridge, tea maker, toaster etc. Free internet connection is also available to our customers. Accommodation cleaning has become one of ourspecial priorities during your stay in Emily’s apartments. Kassiopi is a lovely fishing village on the northeast coast of Corfu,about 36 kilometers from Corfu town. Although the village has grown significantly over the past thirty years, the beautiful harbour and the village square remain largely unchanged. Kassiopi has something for everyone: a fine selection of beaches, plenty of bars, restaurants, shops and boats. We didn't realise that the apartments were serviced which was a lovely treat! Perfect location for Kassiopi, just out of the village up a hill so it was quiet whilst still being close enough for all amenities. There are 4 rooms, 3 of which were booked when we stayed so it was fairly quiet, we had the pool to ourselves most of the time. Perfect apartments - everything we needed, good location, very clean, excellent pool (necessary as beach is pebbled). Would stay there again. Very peaceful, clean and comfortable. Appartments are well equipped and clean. Quiet neighborhood, no loud music or noise coming from the center of the village. Some hens and roosters nearby do tend to give the countryside morning effect, but it's not annoying or anything. The pool is moderate size, not for swimming training, but it's exceptionally clean and enjoyable, with night lights for midnight swim! Overall - a very very good value for money! All recommendations. Very nice in every way. Clean, quiet, near, easy, friendly. We really enjoyed staying in Kassiopi and Emilys. Pool was good, the terrace also. Rooms are large, exept kitchen (but the terrace has good space to have lunch etc). Suomeksi myös ;) eli tätä voimme suositella. Mukava perhe, joka omistaa myös marketin lähistöllä. Yksi perheen jäsen (tyttären mies) hoitaa bookkaukset todella miellyttävästi. Muu perhe sitten hoitaa itse paikkaa. Pyykinpesukone löytyy (yhteiskäytössä), uima-allas on mukava, huoneet suuret, paitsi keittiö. Terassilla kuitenkin mahtuu hyvin ruokailemaan ja sieltä on mukavat näkymät (meillä oli toinen kerros takimmaisessa talossa). Kilometri satamaan, n. 200m kauppaan, rantoja useita, lähin n. 600m, mutta 1,5 km päässä (kävelimme) on useita todella hyviä, kirkkaita snorklausvesiä. Fantastic! Very clean and tidy apartments. Swimming pool fab and a good location to walk into town. Would highly recommend. Adonis was there as soon as we rung with a key and a smile. The apartments were spotless as was the pool. They were just far enough from town to be very quiet but near enough to walk with ease , even in the scorching heat! The bedrooms were large and nicely furnished with free wifi, safe and air con in each room. The kitchen was good enough to cook a small family meal with a kettle included. Both my children aged 8 and 10 loved the pool , so did the adults! The staff are very friendly and cannot do enough to make your stay enjoyable. The apartments are regularly cleaned and maintained and close to ameniities. Usual greek bathroom arrangements but very well equipped in all other ways. Will definitely book again. Der Pool (inkl. Kinderbecken) war großartig uns sehr gepflegt: täglich wurde der Pool gereinigt. Rund um den Poll waren gute Liegen udn Sonnenschirme schön aufgestellt. Ein kleiner Garten wurde ebenfalls täglich gepflegt. Die Zimmerreinigung wurde an 6 Tagen die Woche sehr ordentlich durchgeführt. Sehr regelmäßiger Handtuchwechsel. Schön war auch die Terasse- dort konnte man sehr angenehm den Abend verbringen. Die Betten waren super: nicht zu hart und nicht und nicht zu weich. Das Personal war jederzeit freundlich und stand für alle Fragen (auch unseres kleinen Sohnes) bereit. Die Reinigungsdame sprach nur griechisch, aber die Verständigung klappte auch so und sie war ser bemüht und freundlich. L'appartamento è ampio, nuovo e in ordine. Il terrazzo è grande e pratico. Il giardino e la piscina sono ben curati. Molto vicino a Kassiopi centro dove è possibile mangiare, prenotare escursioni, affittare barche, e fare una piccola passeggiata. Sono inoltre presenti supermercati ed una farmacia. Il mare è raggiungibile a piedi. Puliscono tutti I giorni. Aria condizionata e WiFi. Clean and spacy rooms. Functionable kitchen. Quiet and also very close to the village center. Safety for my children. Wifi all over the place including around the pool. Spacious safe parking area. Easy access to the village, to the main road and to the nearby beaches. The staff is excellent. Recommended!!!! Great time! I will definetely come back next year! Away from any noise of bars but near enough to beach, shops, tavernas etc. Efficient cleaners and always happy to help. Apartment was kept very clean, maid came every day. Apartment was fully equipped/furnished to high standard & extremely comfortable with lovely decor & all modcons. Water was nice & hot & shower powerful. The pool was a good size & never more than a few people around it with plenty of sunloungers & with views of mountains & surrounding countryside was very relaxing. The nearest beach was approximately 15 mins walk & the harbour with bars & tavernas ten. We would definitely go back & will recommend to our friends. Spacious bedrooms and kitchen. Nice and clean swimmingpool. Very friendly and helpful personnel and owner. We had a very pleasant and relaxing stay!! We had a great time in the swimming pool! the BBQ area is unique! The washing machine was a great facility. Wi-Fi all over the place! Emily's Apartements are modern, clean and with perfect service. we got a free lift to the apartment from the centre of cassiopi by the manager. very helpful. at departure, we could put our bags in the supermarket to use the freetime until the bis arrived. also good internet connectivity in all rooms - a big plus. if you like to live surrounded by nature (some small farms around you) this is the perfect place to stay. you also have a barbecue place available if you want to grill. Loved the pool and the apartment. It was very clean and a cleaner came everyday. It was a great location, near to the town centre and the beach and only a 2 minute walk to the supermarket. The owners were also extremely friendly and efficient. Excellent appartments for family holiday.